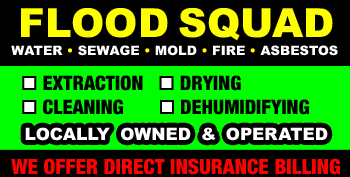 FLOOD SQUAD is a 24 hour emergency water clean up, sewage clean up, flood clean up, mold clean up & fire clean up company. We have emergency water damage removal service with 30 minute response for building flooding or house flooding. Whether it's a building water damage or a home water damage our flood contractors respond fast to start the water cleanup or sewage cleanup service from wet carpet, wet wood floors, wet walls & wet ceilings. We offer insurance billing on flood water damage removal services and sewage cleaning services. Call 1-800-749-7093 for 24 hour water extraction, sewage extraction, mold cleaning, flood cleaning & fire cleaning.